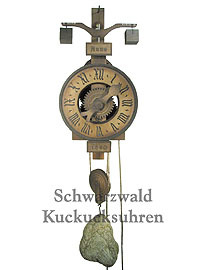 August Schwer Replica Clock: Wooden Clock, One-Handed Clock, Verge and Foliot Clock. This clock is an accurate replica of a historical wooden verge and foliot clock; the original dating back to around 1640. 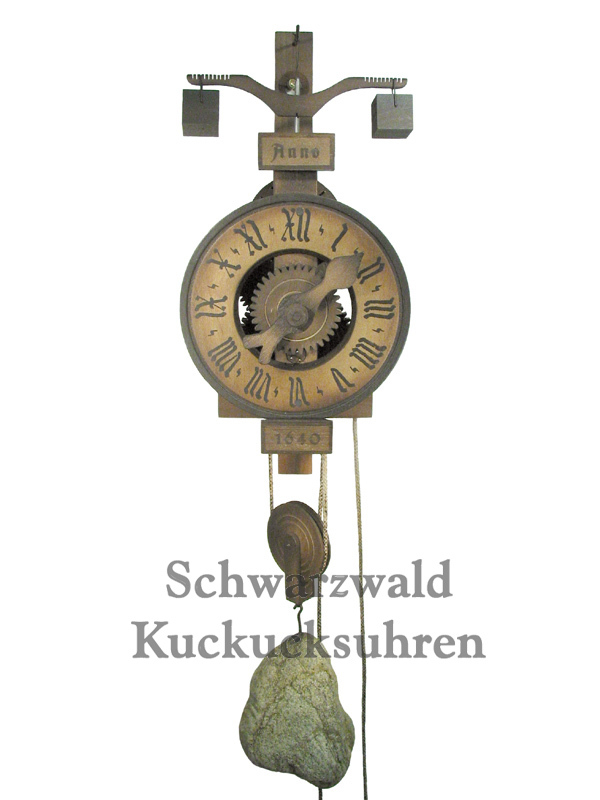 The complete clock and woodworks are handmade here in the Black Forest. The clock mechnism is driven by a stone. The clock uses a verge escapement, which moves the wooden bar on the top of the clock. This horizontal bar, called foliot, oscillates back and forth and can be regulated by the weights on its ends. The clock runs for approximately 12 hours. This is identical with running time of 17th century clocks. Nevertheless, this clock does not keep the time accurately! It is a replica clock which focusses on authenticity. The original 17th century clocks were not able to keep the time accurately! Timekeeping might be 15 - 30 minutes off. The clock has only one hand, the hour hand. size: 14.2 inches tall, 6.7 inches wide, 5.9 inches deep. VdS (Association of Black Forest Clocks) Certificate of Authenticity. August Schwer Black Forest Clock Factory, Schoenwald, Black Forest.